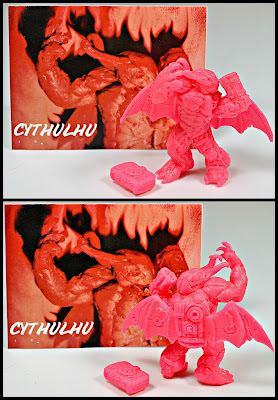 WHAT: One of the latest and most impressive creations to hit the indie mini figure market, Cythulhu puts a cyborg spin on the classic, ever-popular H.P. Lovecraft creature Cthulhu. 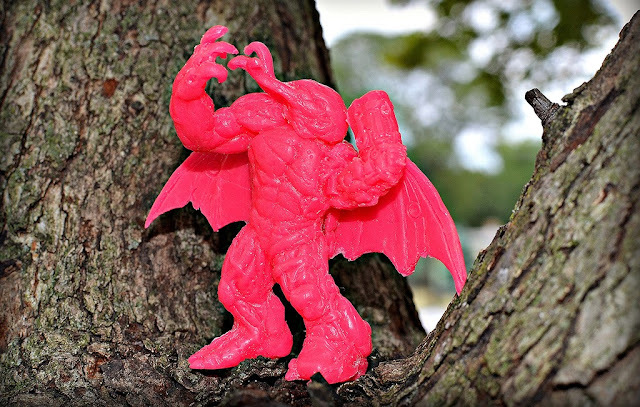 Cythulhu is the last released figure in the original incarnation of the Universe of Violence custom keshi line by Eric Nilla and Jimmy Rommel (I say "original incarnation" because MetalMonkey/Justin Gadze has plans to continue the line, which is very exciting...more on that here!). 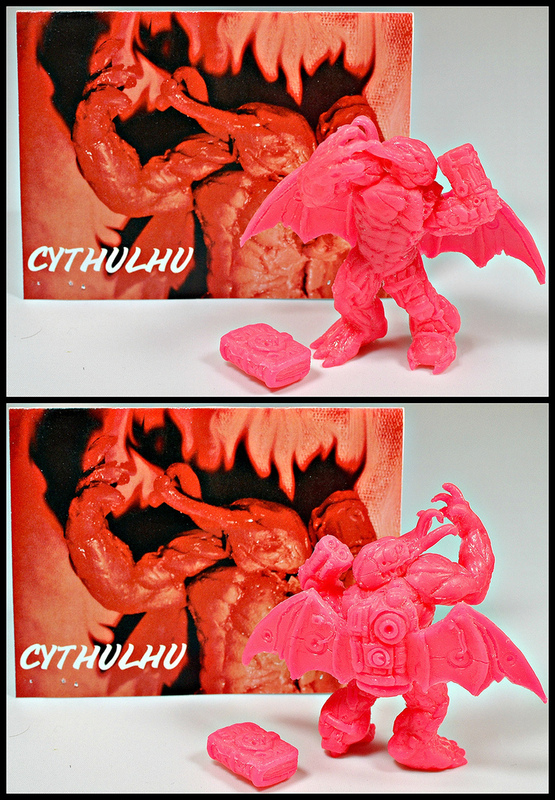 Both the sculpting and casting of Cythulhu were done by Eric. This guy really is fantastic. For one, I love his dynamic, triumphant pose, which makes him look like he's just gained control of the cosmos. Even his facial tentacles are raised up, which is a fun touch. Another feature that adds to the coolness is his removable wings, which plug into two small holes in his back and help get across the cyborg concept nicely with some mechanical-looking details sculpted onto them. These features must have been tough to make happen for a rubber mini figure, but Eric did an excellent job pulling it off. In addition to his removable wings, Cythulhu even comes with a little book accessory--his very own literature called the "Cthulunomicon." 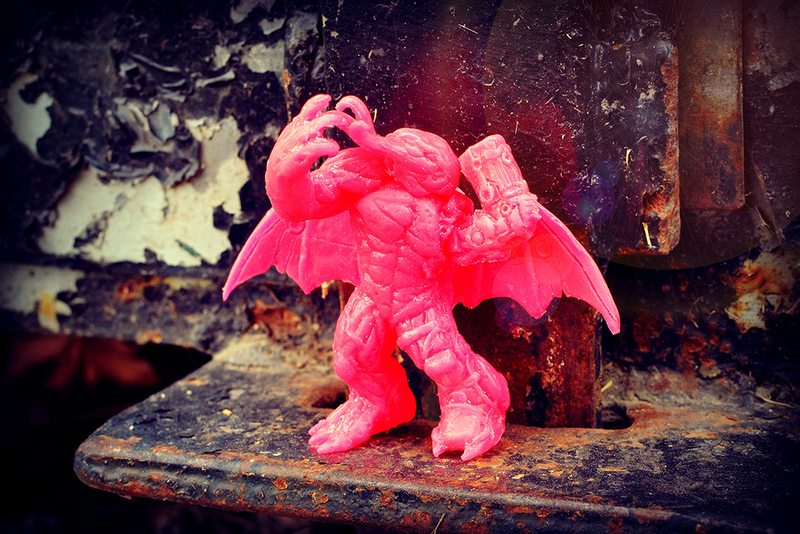 Cythulhu has been released in a wide range of colors, and as you can see my particular figure is a vibrant neon pink. Although it can be tough to photograph, I am a big fan of the color and think this character looks great in it. Between the detailed, dynamic sculpt and the bright color, I don't think this figure could be any more eye-catching! WHEN: Cythulhu first became available in July of 2013. At the time of writing this post, the figure is still available to purchase in multiple colors. WHERE: Sold online via Eric Nilla's store. WHO: Designed, sculpted, cast and sold by Eric Nilla. Love this figure! Eric really killed it with this one, and that hot pink is a great colour. Nice review as always buddy! Thanks man...can't wait to see your new UoV figures! Sure, Eric. Great work on this guy!